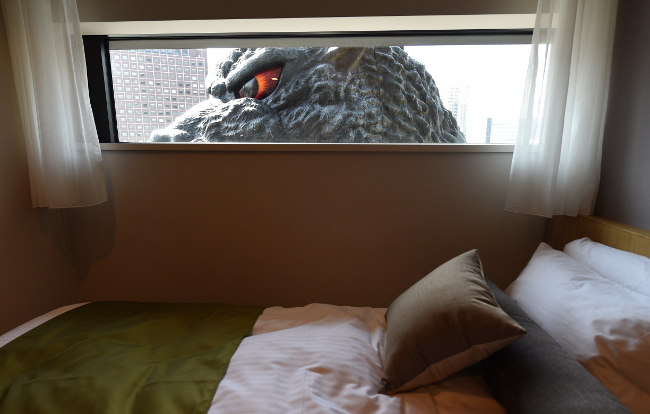 Looks like Tokyo just got a great theme hotel. 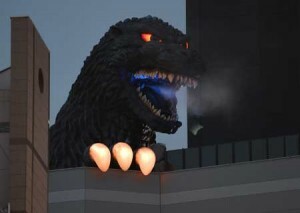 What’s better than an overnight stay in Tokyo and seeing this from the window? Fittingly built at the old Toho Shinjuku Theater Building, they stuck a life-sized head 17 stories up, and the hotel sports a few View Rooms for about $125/night, and a special Godzilla-themed suite for around $330/night. 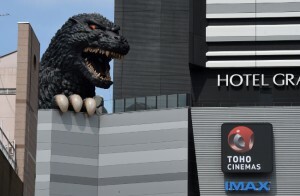 Is it racist that I’d dearly love to visit, just so I can run out in the street in a baseball cap and glasses, point up and scream “Godzirra!!!!”? Apologies for the music, but here’s a vid with the inside of the hotel…. I think it’s great when corporate development and municipal zoning embraces the lighter side of things! Hignose posted this entry on Sunday, April 12th, 2015 at 1:57 pm. Posted in the category Entertainment, General, Travel	You can follow any responses to this entry through the RSS 2.0 feed. You can leave a response, or trackback from your own site. At $330 a night I want fire breathing. Not too much to ask. They make the drinks smoke.